Qualfon and Haven for Hope have formed a business alliance that is helping people in San Antonio, Texas move beyond homelessness. While Haven for Hope provides housing programs and social support services to help people address the root causes of homelessness, Qualfon’s contact center provides job opportunities for Haven for Hope residents. Haven for Hope is in the business of transforming lives. That’s why it’s so important to have the opportunity for meaningful work located right on the Haven for Hope campus. Qualfon, a mission-driven business process outsourcing (BPO) company and global provider of contact center services, and Haven for Hope have formed a business alliance that is helping people in San Antonio, Texas move beyond homelessness. Haven for Hope, a campus of new beginnings for men, women, and children experiencing homelessness, provides housing programs and social support services to help people address the root causes of homelessness. 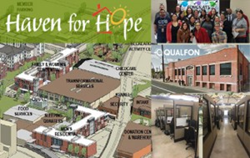 Meanwhile, Qualfon’s contact center provides job opportunities for Haven for Hope residents. As a part of the alliance, Qualfon and Haven for Hope held a tour event in July that offered an inside look at how the partnership works. The event included presentations, site tours, and testimonials from graduates who have used the program to establish financial stability and move away from the Haven campus support network. “Over the past two years, we’ve witnessed multiple people reach a state of continued independence by following a career pathway that Haven for Hope and Qualfon pioneered together. Through our partnership, we piloted and perfected this program, and this event allowed people to walk in the shoes of a person struggling with homelessness to see for themselves how this alliance is making a positive impact,” said Kenneth Mitchell, Director of Employment Readiness, Haven for Hope. At the contact center, Haven for Hope members work alongside Qualfon employees to provide customer service on behalf of Qualfon’s clients. While Haven for Hope identifies motivated, prospective employees for the contact center, Qualfon offers career opportunities that can pave the way toward a new chance at life. “The contact center has been good for people and good for business. It delivers high-quality service at or above client performance goals, and it enables people to build a more self-sustaining existence,” said Tatarian. Learn more about the Haven for Hope and Qualfon alliance program. Haven for Hope is an independent, nonprofit organization with the mission of transforming and saving the lives of persons who are experiencing homelessness in Bexar County. Beyond shelter, food, clothing and a wide array of social services in one location, Haven for Hope provides individuals and families with the resources, skills and assistance needed to become self-sufficient. Since opening in April 2010, nearly 3,000 individuals have graduated from Haven for Hope and moved from homelessness to permanent housing. For more information on Haven for Hope, visit http://www.HavenforHope.org.